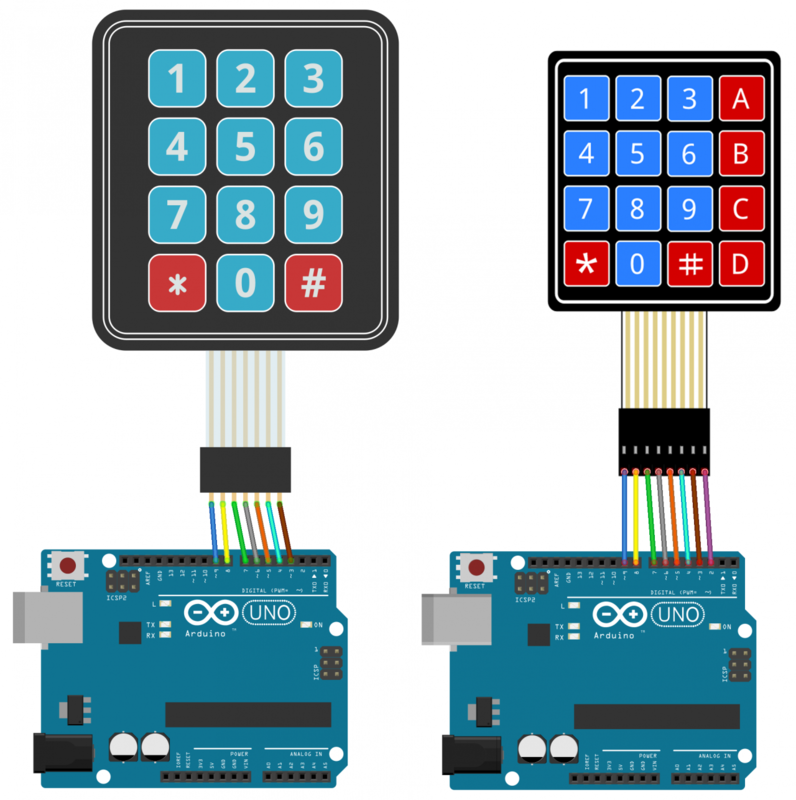 Keypads are a great way to let users interact with your project. You can use them to navigate menus, enter passwords, and control games and robots. 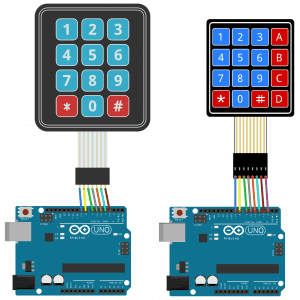 In this tutorial, I’ll show you how to setup a keypad on the Arduino. First I’ll explain how the Arduino detects key presses, then I’ll show you how to find the pinout of any keypad. As a simple example, I’ll show you how to print out the key presses on the serial monitor and an LCD. 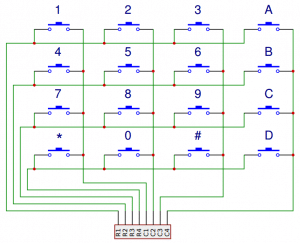 Finally, I’ll show you how to activate a 5V relay when a password is entered correctly. 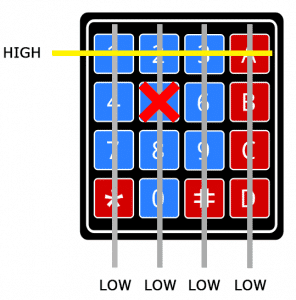 I’ll be using a 4X4 matrix membrane keypad in this article, but there’s also code and wiring diagrams for 3X4 matrix keypads as well. 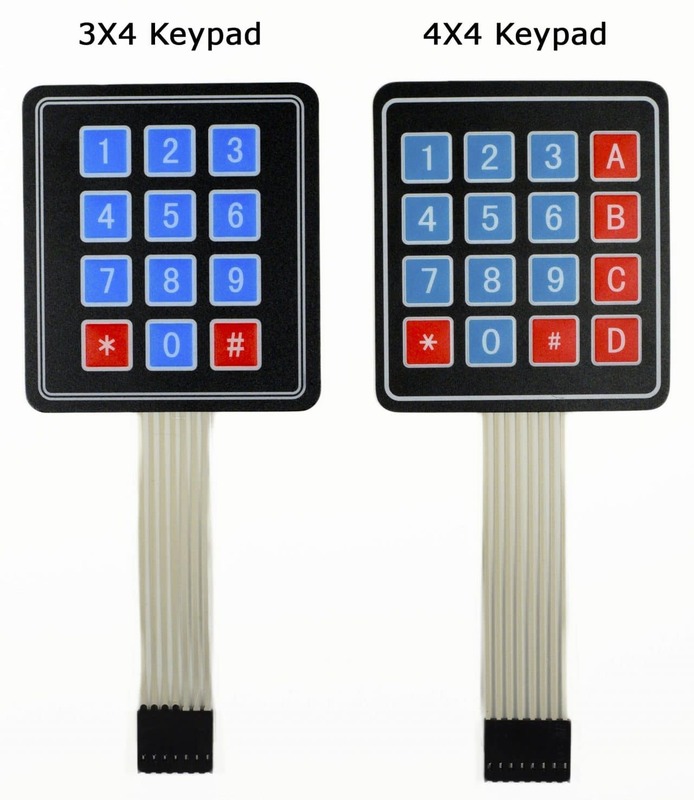 I like membrane style keypads because they’re thin and they also have adhesive backing so you can stick them to most flat surfaces. 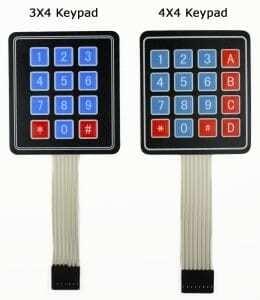 You can also get telephone style keypads that have thicker buttons if you like that style better. Even salvaged keypads from old telephones will work with the Arduino. Pressing a button closes the switch between a column and a row trace, allowing current to flow between a column pin and a row pin. The Arduino detects which button is pressed by detecting the row and column pin that’s connected to the button. From the diagram above, you can see that the combination of row 2 and column 2 could only mean that the number 5 button was pressed. 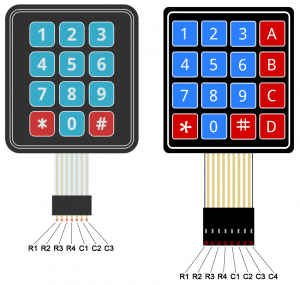 First, find out which keypad pins are connected to the button rows. Insert the ground (black) wire into the first pin on the left. Press any button in row 1 and hold it down. Now insert the positive (red) wire into each one of the other pins. 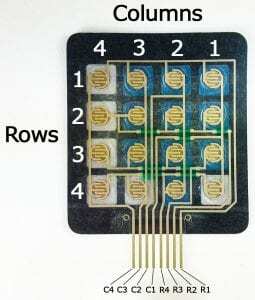 If the LED lights up at one of the pins, press and hold another button in row 1, then insert the positive wire into each one of the other pins again. 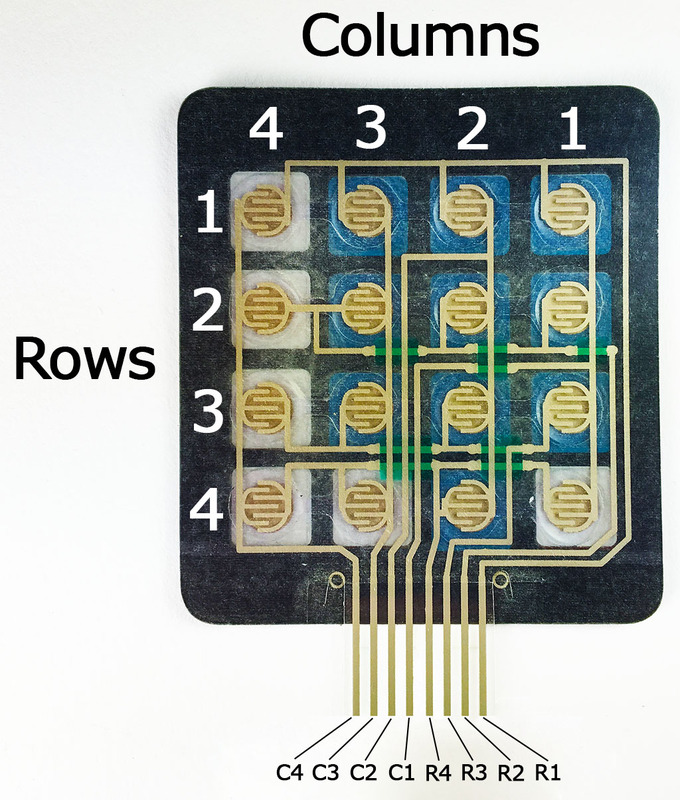 If the LED lights up on a different pin, it means the ground wire is inserted into the row 1 pin. If none of the buttons in row 1 make the LED light up, the ground wire is not connected to row 1. Now move the ground wire over to the next pin, press a button in a different row, and repeat the process above until you’ve found the pin for each row. 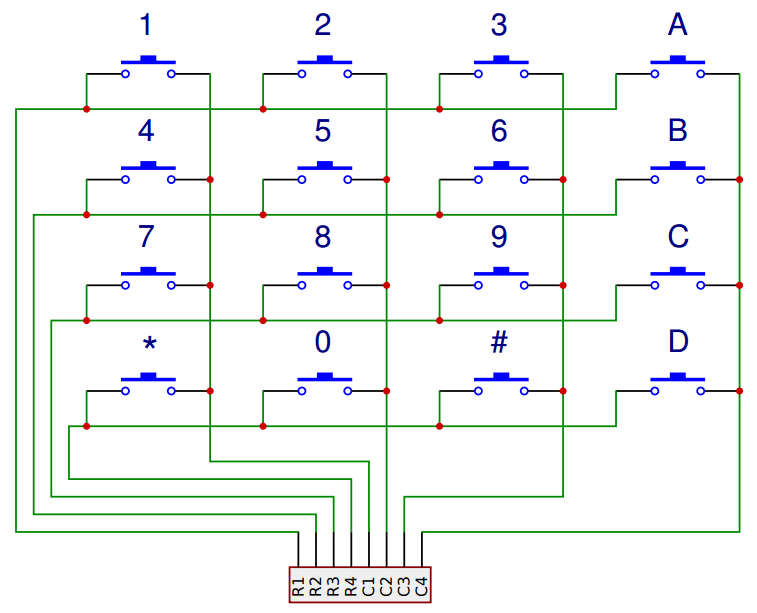 To figure out which pins the columns are connected to, insert the ground wire into the pin you know is row 1. Now press and hold any one of the buttons in that row. Now insert the positive wire into each one of the remaining pins. The pin that makes the LED light up is the pin that’s connected to that button’s column. 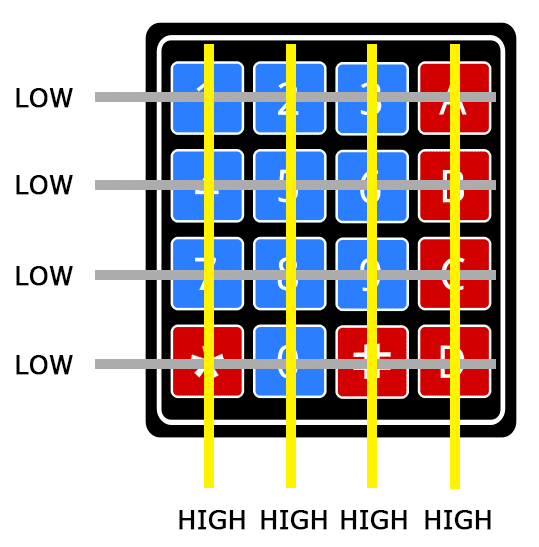 Now press down another button in the same row, and insert the positive wire into each one of the other pins. Repeat this process for each one of the other columns until you have each one mapped out. 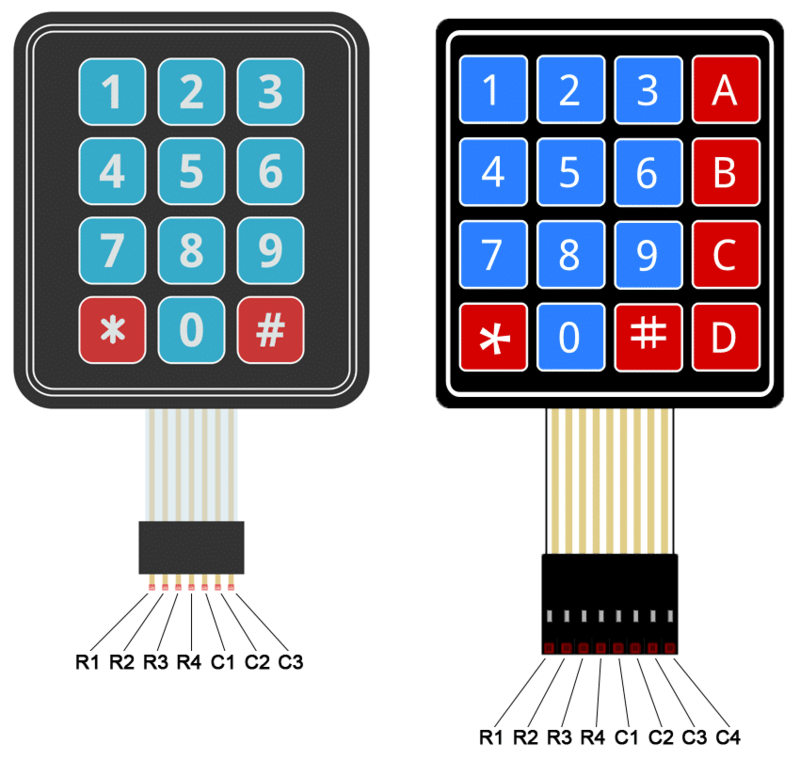 For a basic demonstration of how to setup the keypad, I’ll show you how to print each key press to the serial monitor. We’ll use the Keypad library by Mark Stanley and Alexander Brevig. This library takes care of setting up the pins and polling the different columns and rows. To install the Keypad library, go to Sketch > Include Library > Manage Libraries and search for “keypad”. Click on the library, then click install. Lines 3 and 4 in the code above set the number of rows and columns on the keypad. Now let’s see how to print the key presses on an LCD. 4X4 keypads use 8 pins and 3X4 keypads use 7 pins. 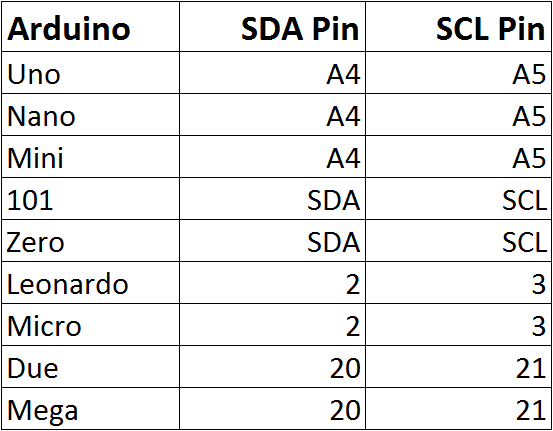 That takes up a lot of pins, so I’m going to use an I2C enabled LCD because it only needs 4 wires to connect to the Arduino. 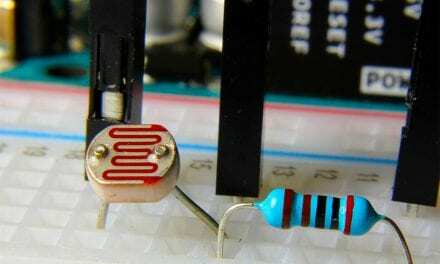 The Wire library is needed to add support for I2C communication. 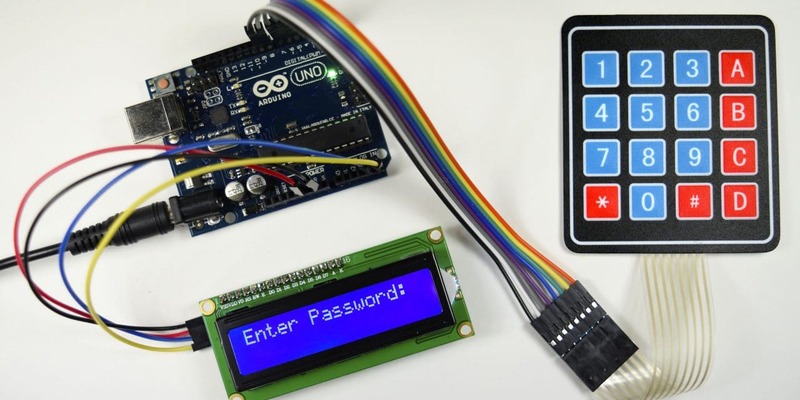 It comes packaged with the Arduino IDE, so there’s no need to install it. But if for some reason it’s not installed on your system, go to Sketch > Include Library > Manage Libraries and search for “wire” to install it. 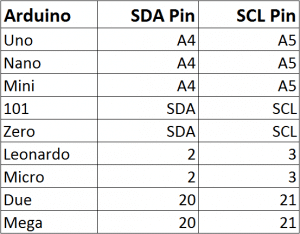 The I2C address of my LCD is 0x21, but your’s will probably be different. 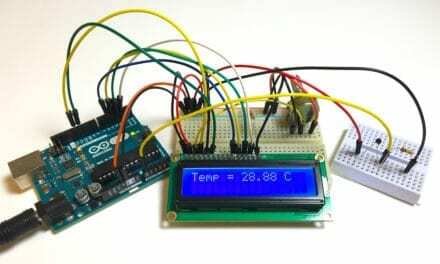 The I2C address of your LCD should be provided in the datasheet, but if not, you can find it by running this I2C_Scanner sketch. The password in the example above is only 7 characters long, but the password length is actually one greater than 7 because there is a null character added to the end of the string. For example, if your password is 5 characters long, you would enter 6 for the password length. Well that’s about it. It’s not hard to set up a keypad at all. 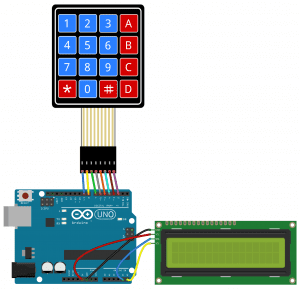 I think with a little trial and error you should be able to modify the code above to work with most of the projects you’d want to use a keypad for. But if you run into problems, just let us know in the comments and we’ll try to help you out. is it possible to get this code working with multiple passwords? i have the same lcd that you used i this project but there are no pins on the left side of the lcd. please help! I love to do this project, but do you have a fail-safe option? something like a bypass for example if the system failed to respond due to unexpected error? loose wire, broken relay, etc… Hope you could me with this. 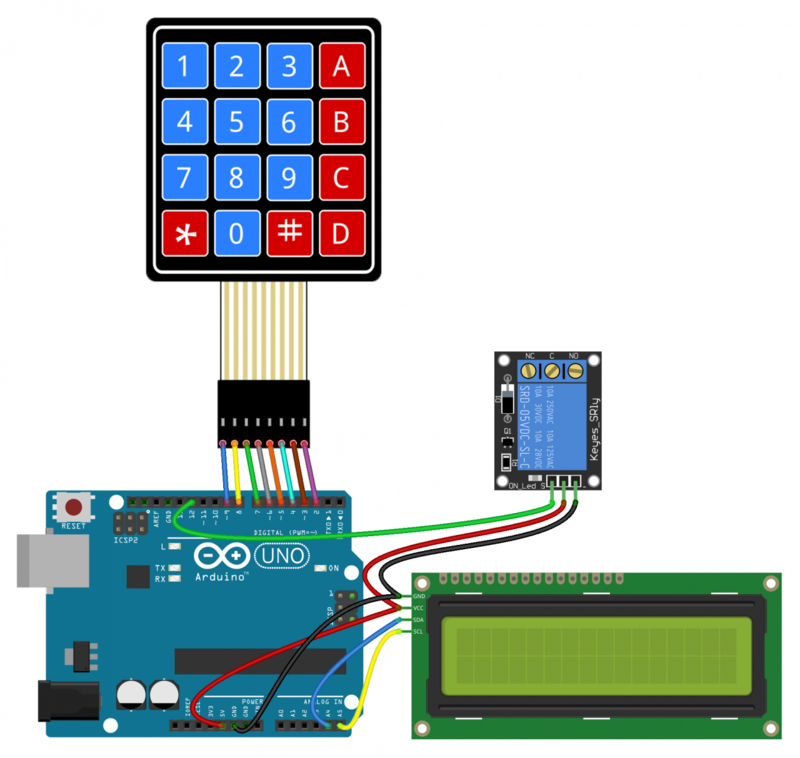 Your keypad arduino was the best i found online. i’ve changed the code, i do not have a display yet, so it prints on the serial monitor. the pass can be changed using a master password. i`ve changed this code a little bit because I couldn`t make this program working so I`ve changed code for display and now it works awesome !!! 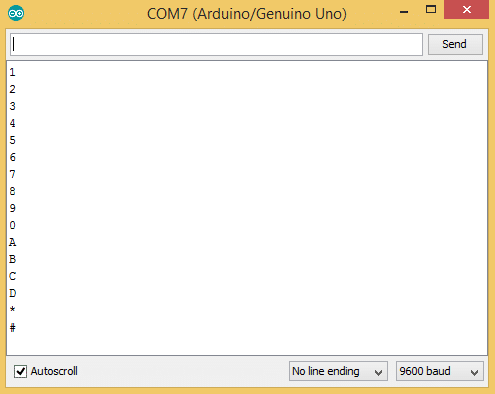 I DON`T KNOW WHAT HAPPENED TO THE CODE BECAUSE IS COPYED OUT FROM ARDUINO SOFTWARE BUT HERE IS MISSING FEW THINGS ( #include #include #include AND MORE…) SO IF YOU KNOW WHAT i DONE HERE YOU WILL UNDERSTAND HOW TO FIX THIS MISTAKES. I have not understood how this works? If you mean the code as written with a single minus sign than it doesn’t. If you mean the original with two minus signs then read on. Data is an array of chars and this code is meant to walk backwards through it and set each char to the null char, aka char(0). Based on the code this is neither necessary nor 100% correctly done. Starting with the fact that it is unnecessary. Data is neither printed nor tested unless data_count is equal to 7 and therefore simply setting data_count back to 0 would suffice as all chars would be overwritten on next password entry. This however does leave the last typed password in memory which could be a security concern. It could also cause other unintended effects if the code was expanded upon. Thus clearing it is a better option. Now for the intention of the code. It is meant to set all chars to the null char. However it does not do this. After entering the password, data_count equals 7 and thus on the first pass through the loop it sets character 7, aka the 8th character, aka the null terminator, to null which it already is. The loop then exits when data_count reaches zero but before setting Data to 0 leaving the first character of the password in memory. By changing the line Data[data_count–] = 0 from post-decrement to pre-decrement as in Data[–data_count] = 0 it would then correctly set the chars with indexes 0 – 6 to 0 and work as intended. In that last line there should be two minus signs after the first data_count and then two minus signs before the second data_count but the forum changes that to only one apparently. I also notice the time of the post is GMT and not local time. Great website! 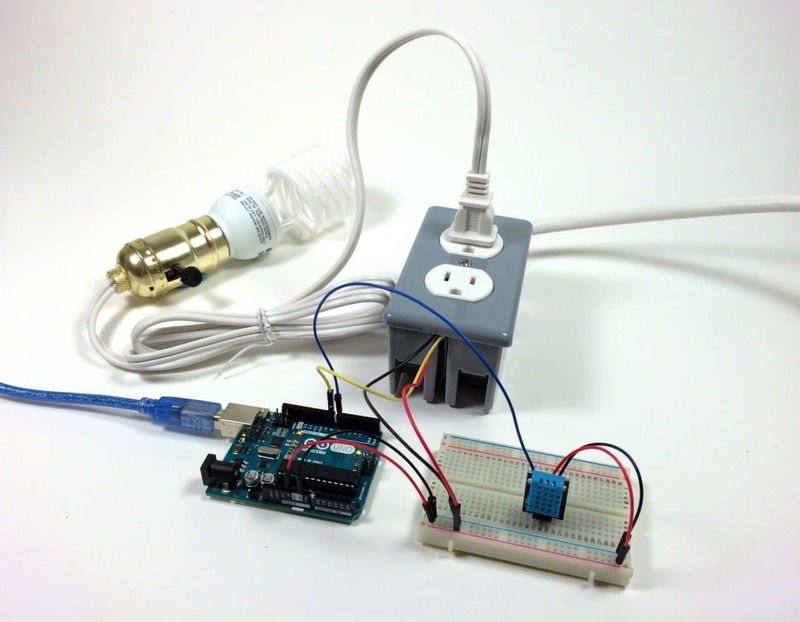 I need to determine a temperature limit with a remote so the temperature sensor activates the relay. The DHT works fine but I can’t make the remote to do inputs for no reason. Can you help? customKeypad = Keypad(makeKeymap(hexaKeys), rowPins, colPins, ROWS, COLS);”.what does that means. my project is smart shopping cart. 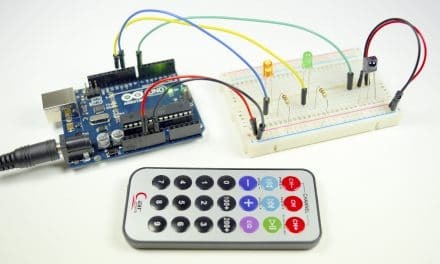 but i am confused about how setup keypad with this project because when i read rfid card on rfid reader and i want to buy multiple items so i want to do that when i read one product so in keypad i choose 2 so one time i read the product and i buy two items with keypad.